The city ramps up its push for energy-efficient housing that doesn’t shove buyers out of the market. A bank of solar panels on a local home. Some have forgone traditional roofing materials in favor of gardens and solar panels. Some boast of windows perfectly aligned to capture all the day’s sunshine and reduce the need for heating and lighting. And some have wrapped decades-old, draft-inducing facades with layers of airtight insulation. Boston, which led the nation a decade ago in the adoption of green building standards and still does, is in the midst of a push to extend the practice deep into the housing supply. It’s an effort both planners and private developers are promoting as crucial to reducing the cost of living in this already expensive city and cutting greenhouse gas emissions. But it can be a massive, and pricey, undertaking. Builders who have either made significant upgrades to existing structures or created projects with notably low energy use say their viability rested on a unique mix of government and private incentives. Boston requires all new construction of more than 50,000 square feet to be Leadership in Energy & Environmental Design, or LEED, certifiable. New city-supported affordable-housing construction is held to an even higher standard; they must be LEED silver certifiable. High-performance green features are becoming a mainstay of new high-end housing, but the market provides less encouragement for smaller-scale projects seeking to offer similar efficiency. John Dalzell, who leads green-building initiatives for the Boston Redevelopment Authority, said he sees state-of-the-art building as a selling point for the entire city, not just for specific developments. He views efficient, affordable housing as a competitive advantage for Boston. One major effort underway in Boston is the E+ program, which is selling off city-owned property to developers who promise projects that will produce more energy than they consume. A collaboration of the departments of neighborhood development, environment, energy, and open space, and the BRA, E+ completed its first project two years ago, transforming a vacant lot several builders had tried and failed to develop. That four-unit, $1.6 million development along Marcella and Highland streets in Roxbury sold before it was even completed, a rarity in that area. Three of the units went for the market price of $550,000 and another, designated as affordable, was snapped up for $217,000. The three-bedroom units went for the market rate, Dalzell said, but the energy savings makes them more affordable than comparable homes. The development is LEED-platinum certified. To ensure that the project creates enough energy to be “net energy positive,” meaning that the units are creating more power than they are consuming, the residents were required to place solar panels on the roof. The owners of three units bought the devices themselves for about $50,000, and the fourth leases them from a contractor for $150 per month. The Roxbury units return energy to the grid in exchange for credits against the power they use, and they can even generate revenue if they produce a surplus. Some green improvements can be done at relatively little cost — the placement of windows to maximize the absorption of natural light, for example, or the inclusion of LED or compact fluorescent light bulbs — but others are much more expensive. Kamran Zahedi, who oversaw the development as president of builder Urbanica Inc., said he can’t imagine doing a project like the one in Roxbury without the help of the government and private groups. There was the subsidized land, public grants, and help from the utilities. Volunteer carpenters from the local union chipped in their time, honing their skills. Without those contributions, Zahedi estimated, the cost of the development would have been 20 percent higher. Zahedi, however, agreed with city officials who say the benefits of the E+ initiative go beyond the results of a specific project; it creates a model for other developers to follow and bring buyers into neighborhoods. The city, which has 52,800 affordable-housing units, estimates that by 2030, 9,700 new low-income families who may be rent burdened will move into Boston. Since 2009, about 1,945 LEED-certifiable affordable units have been permitted and roughly 840 are planned, according to Lisa Mansdorf Pollack, director of media and public relations for the Department of Neighborhood Development. But those projects don’t reflect the strides made in public housing. Several years ago, the Boston Housing Authority adopted a comprehensive plan to make its 12,000 units more energy efficient. As part of that initiative, it entered into an energy performance contract with a private company, Ameresco, to do $65 million in improvements over four years at 13 sites. The project will be paid off using the savings from the reduction in energy costs, according to Kate Bennett, deputy administrator for planning and sustainability. 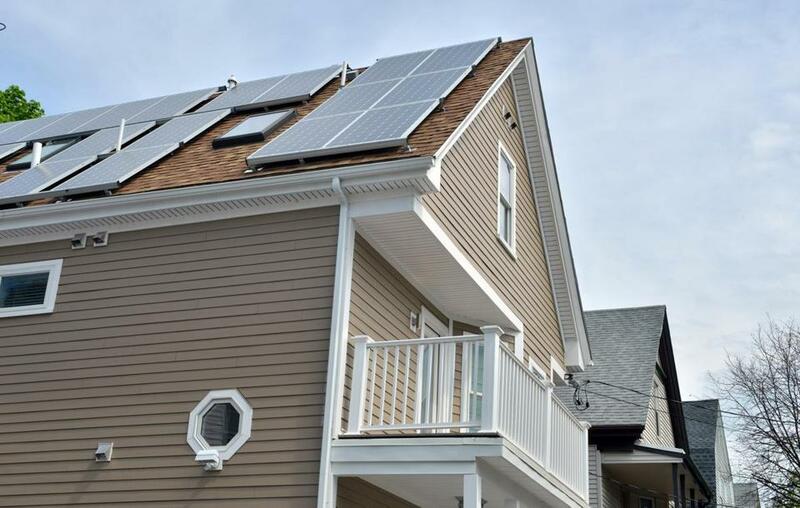 In its first year, E+’s Highland Street development generated a surplus of 8,000 kilowatts — enough to power a typical new three-bedroom home in the area for a year. The builders used recycled steel to reinforce the concrete that supports the structure, and the appliances are highly rated for energy savings. The development was built to use harvested rainwater to irrigate the landscaping, which Resnikoff, a digital content editor for the Unitarian Universalist Association, and his fiancee and neighbors maintain. Energy-efficiency also has driven projects to retrofit existing buildings — another key strategy as the city seeks to improve, rather than replace, housing. At Castle Square Apartments , a South End low- and moderate-income rental-housing development built in the 1960s , the tenant’s association has 51 percent ownership of the building. When WinnCompanies , the minority owner, asked residents what they’d like to see, the problem was clear. Together, the owners figured out a way to cut energy use by 52 percent in a 192-unit section of the 500-unit project, a reduction they achieved largely by wrapping a portion of the building in an insulating shell; replacing windows, boilers, and air conditioners; improving ventilation; and using solar power to heat water. Crimmin said the work can be considered a model for how to retrofit an existing building. He also pointed out that because Castle Square was already planning to make improvements, it was easier to increase the scope of the project and keep it affordable for residents. The project still needed a big infusion of public funds, however, including some from the American Recovery and Reinvestment Act. The total construction costs were about $50 million. That’s one reason Crimmin is such a strong supporter of the city’s E+ program (Castle Square was not one of the projects). “Because US energy prices are low compared to Europe and other developed countries, there is some need for utility rebates or other public funding to bridge the gap between a standard renovation and a deep energy retrofit,” he said. Incentives are also an important driver in public housing. Dan Helmes, energy manager for the Boston Housing Authority, said federal and other efficiency programs have helped the cash-strapped agency find ways to make improvements it couldn’t otherwise afford. The upfront costs save money later, he said. That project to shore up the 13 public housing sites is expected to save $4.8 million annually. The city is also ramping up its push for energy-efficient private development in the city. Larger projects are on the horizon for Boston’s E+ program, and it all began with smaller-scale developments like the one in Roxbury. Sebastian Mariscal, a designer whose studio is behind the proposed rental development, said it is much easier to scale a project in an affordable way when building from scratch. The plan calls for using rooftop gardens to help insulate the units. It also would allow residents to access their apartments through outdoor entrances, eliminating the need to heat, cool, and light common spaces. Mariscal said his development, like any other, is shaped by its circumstances. The Mission Hill project is intended to suit the needs of the market and to fit into its designated space. He said the requirements of the city program were just as much of a driver for the development. “If you want to do a project just like any other project, and try to build it energy positive, that’s a challenge,” he said.